The cases, published in your last number, of injuries of the head, with loss of a portion of the brain, have brought to my mind a case which I attended some years since, which may be deserving of record, as a case of recovery after a portion of the brain had been severed from the cerebral mass, replaced, and apparently reunited. A scenario which seems somewhat… implausible. 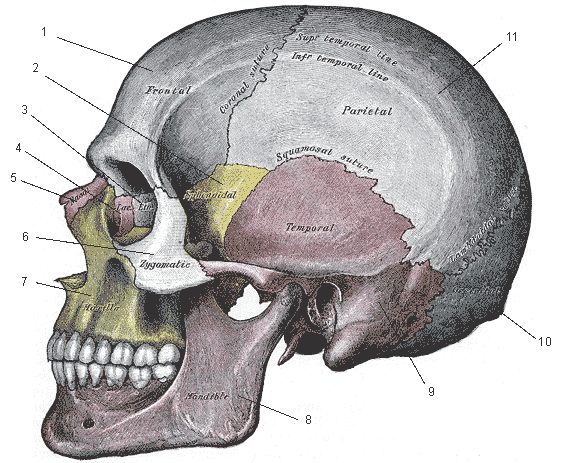 The wound was made by a sharp axe, which, in the hands of a strong and angry man, was driven with such force as to make a section of the skull, cutting off a portion of the brain, which remained in its situation in the severed portion of the skull, hanging down on the shoulder, attached by a strip of integuments to the neck. The part cut off was the posterior part of the parietal bone, and the orifice through the inner table of the skull was about an inch and a half, and the portion of brain excised over an inch, in diameter. The phrase ‘hanging down on the shoulder’ makes me shudder. This was a very bad injury to the back part of the top of the skull – somewhere to the right of the figure ’11’ in the above image. The bone concerned lies over the posterior parietal cortex, a part of the brain which deals primarily with movements and spatial awareness. The man was able, after the injury, to walk some rods, with assistance, and talked in a rational manner by the way. Securing the occipital artery, which had been divided, removing some small fragments of bone, shaving around and thoroughly cleansing the wound, I restored the flap of integuments, with the portion of skull and brain, to its proper position, and secured them by stitches, adhesive plaster, and a roller. Unpleasant for the patient, I imagine, but probably the best that could have been done for him in 1852. There was a great danger of infection, given the nature of the wound. The head was kept elevated and cool, a light diet enjoined, and a solution of sulphate of magnesia, and tartrate of antimony and potassa, given to move the bowels, reduce the circulation, and restrain the appetite. A mid-19th-century doctor rarely lost an opportunity to get his laxatives out – whether or not the malady had anything to do with the bowels. But maybe they weren’t such a bad idea, given the man’s subsequent rapid recovery. The mental faculties remained unimpaired, except for a short time on the second day; the wound healed rapidly, being entirely closed in a week, no unpleasant symptoms afterwards occurred, and on a subsequent examination the severed portion appeared to be firmly united to the cranium, no motion being perceptible on firm pressure, and no inconvenience being felt when galloping on horseback. I love that last observation: apparently the patient was worried that he’d be able to hear bits of his brain rattling around inside his skull. There was no evidence in the dressings of the discharge of any portion of the brain, and, in all probability, the severed portions reunited without loss of substance. The case was watched with some interest to mark the development of any peculiar mental phenomena, but nothing occurred worthy of note, though, at the time of the examination of the wound, pressure was made upon the exposed portion of brain. Certainly an impressive recovery from an axe to the skull. But was brain matter really ‘severed, replaced and reunited’? I’m wading in much deeper than my expertise here, but I’m pretty sure that that simply isn’t possible with brain tissue. I imagine that the severed tissue died and was reabsorbed. If any of my readers are more confident in their neurological knowledge, please feel free to leave your verdict in the comments. I’d also be curious to know what a specialist in the field would say about this injury. From the description, this patient beat Phineas Gage all hollow. I’m surprised that he didn’t die from an infection. Also, I wonder why someone took an ax to his head in the first place!